The best part of my job is when I get to visit the countries and the people who we work with and serve. This time round, I was fortunate enough to visit my first upper-middle-income country: Azerbaijan. The World Bank estimates that 86 middle-income countries in the world account for just under half of the world’s population. and they are home to one-third of poor people in the world. As an upper-middle-income country, Azerbaijan boosts excellent infrastructure, which made my 270 kilometre travel to the IFAD-funded Integrated Rural Development Project in Yevlakh a pleasant “stroll”. IFAD-funded interventions in Azerbaijan which are closely aligned to the country’s agriculture and rural development strategies have helped develop the agriculture sector as a dominant force in the rural economy and improve food security by providing rural communities with access to assets and services for the sustainable management of natural resources, including improved irrigation and rangeland management. This has resulted in improved living conditions of disadvantaged rural communities. The Integrated Rural Development Project is assisting rural people to use available natural resources effectively and efficiently allowing them to increase crop and livestock productivity. Furthermore, it is providing smallholder farmers access to credit so that they can improve the existing irrigation infrastructure. “Our goal is for the smallholder farmers to rehabilitate all the irrigation infrastructure, own their equipment, establish water-user associations and embrace good husbandry practices”. As part of its agriculture and rural development strategy, the government has put in place measures to improve the living conditions of rural people. One of these, was the rehabilitation of the green houses which is a reminiscence from the Soviet era. Mehbara Davudova, a well-established smallholder lady farmer, is running a thriving farming business on her 0.15 hectare land thanks to an initial credit of 4000 manat (US$5000). “Thanks to the loan which I was able to repay in two years, I was able to setup five green-houses, where i plant vegetables 12 months a year”, says Davudova. Davudova’s farming business provides her a secure income of approximately 1500 manat per month. This has allowed her to rehabilitate two irrigation systems on the farm, build a house and send her 16 year daughter and 8 year old son to school. “I am hoping that with the profit of the next harvest season, I’ll be able to build another house”, says Davudova with a smile. 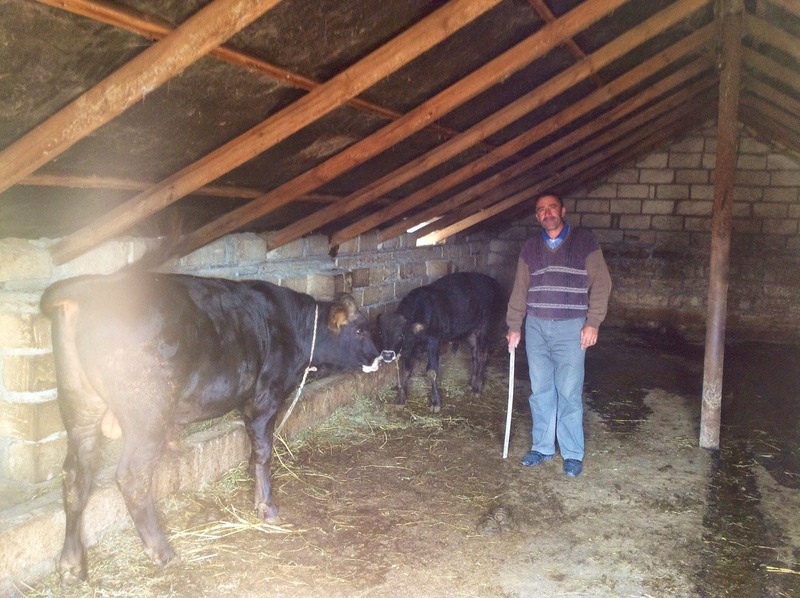 In the neighbouring farm, Sultekin and Arastun Mammadov are also running a flourishing farming business and are engaged in husbandry and livestock. Visiting their greenhouse, the Mammadovs told me “In winter, just to make sure that cold weather does not damage the crop, we use heaters”. When I asked them if they had any fire safety and security measures in place, they did not seem too impressed by my question….. They were however, intrigued by the proposition of exploiting their livestock further and putting in place biogas digesters to heat the greenhouse. I committed to put the various parties in touch with our colleagues working on the portable biogas project in Kenya. Who knows, maybe if I get lucky again and have the fortune of visiting them, they will be running highly efficient biogas digesters, providing not only heating for the greenhouse, but also electricity and gas for the kitchen! Before heading back to Baku, we visited Mahir Aliyeb, a herder. 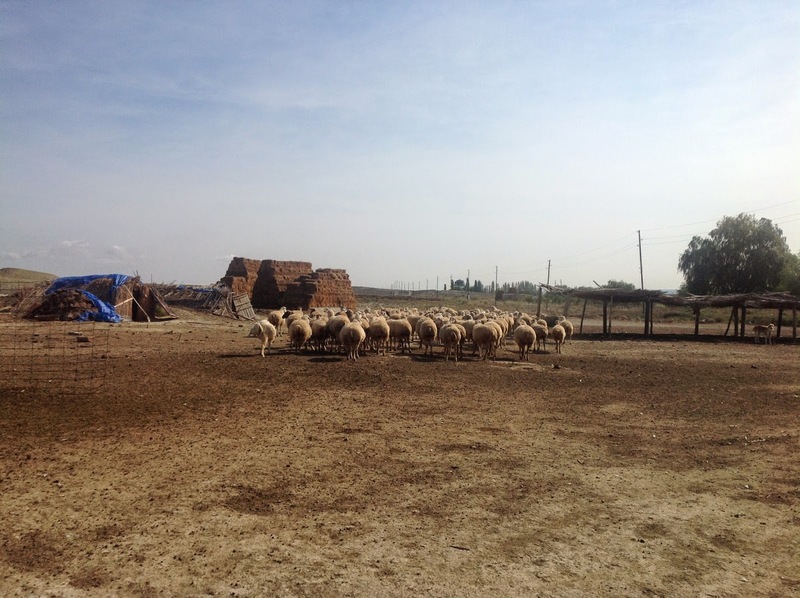 Aliyeb was able to buy 40 heads of livestock thanks to a loan of 10,000 manat. He probably is a precursor to the future project beneficiaries of IFAD-funded activities. Aliyeb is renting the land neighbouring his property for grazing purposes. “I pay 2 manat per hectare every year for this grazing land, allowing the cattle to graze on alfa-alfa”, explains Aliyeb. As an acute businessman, Aliyeb has diversified his source of income. He is making good profit with his daily 25 litres of milk and gets additional income by selling sheep wool and animals to the local abattoirs. The future holds bright prospects for Aliyeb and his fellow herders, as the next generation of IFAD-funded programmes and projects in Azerbaijan will focus on developing and strengthening value chains with a focus on the livestock sector and more specifically on improving traditional husbandry practices, putting in place traceability mechanism, as well as enhancing quality and hygiene standards while helping to access new markets. Hopefully soon, Aliyeb will be able to package his dairy products and not only sell them in supermarkets in Baku and other cities in Azerbaijan, but also start exporting them to neighbouring countries.